The evolution of European policy-making strategies towards a more international scope (i.e. Erasmus+), calls for exploring new collaboration arenas at international level. ERYICA aims at reinforcing and deepening its relationships and cooperation with a selected group of international and partner organisations, while of course staying open to collaboration with other stakeholders. ERYICA benefits from these close relationships to advocate for youth information at European and national level. For example in 2016, in cooperation with EYCA and Eurodesk, ERYICA wrote a position paper with recommendations on the new EU Youth Strategy. ERYICA is also observer of the CDEJ (European Steering Committee for Youth), a statutory body of the Council of Europe that co-manages the youth activities and budget of the Department of Youth and Sport together, on an equal basis, with the Advisory Council on Youth. Meetings of the CDEJ have been seized as an opportunity to discuss youth information development with the responsible persons of the Ministries in charge of youth. This manual for foresight in youth information was published in the framework of the project 'Future Youth Information Toolbox'. The manual looks to the future of youth information, involving a broad range of stakeholders in the process, and observing societal trends and developments. Foresight is an overall term for different methods and approaches to take uncertainty, complexity and ambiguity into account when exploring possible futures and planning for transformative actions. The objective of foresight rests upon the assumption that the future is in the process of forming and there can be scope to speculate plausible changes and prepare accordingly. Future foresight explores the fields of future studies, strategic planning and policy analysis. This manual breaks down the concept of foresight, giving practical tips on how to carry out foresight methodologies. 3 different methods have been piloted and used as examples. The manual is targeted not only for youth information workers, but also for those who plan, execute and make decisions in the youth field. We hope that this will be a useful tool to help you prepare your work for the future! You can read the manual here. To evaluate the service quality and to understand the perception of young people towards youth information and counselling services, ERYICA conducted a survey for service users back in 2013. At the end of 2017, a new survey was conducted across Europe in the framework of the Erasmus+ KA2 Project Youth.Info: Future Youth Information Toolbox. This time the aim was to study information behaviour and experiences with youth information and counselling services of both users and non-users of the services. The primary objective of the survey was to analyse the usage pattern of the current user base, and to compare it later with that of the non-users. In the process, the survey strived to reveal the most preferred sources of information, the perceived reliability of sourced information, preferred presentation form and media, and young people’s trust in youth information and counselling services. Parallel to the survey, the project conducted a foresight study comprising three different methods to identify possible changes in the youth information landscape in the coming years. The insights obtained from the Scenario Planning, Future Youth Camp, and Delphi Survey provided directions to understand the information behaviour of young people and helped interpret the survey results. You can read the report here. This report, carried out in cooperation with Eurodesk and EYCA, and in the framework of the project ‘Reach more young people! 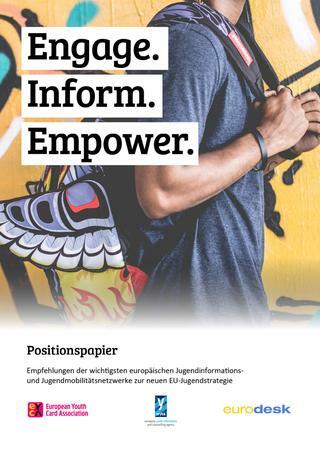 Promotion of Youth Work and Youth Information Centres’, provides valuable information about the difficulties that youth (information) workers face when reaching out to and communicating with young people. It illustrates numbers, but also youth workers’ personal experiences about the challenges they face when dealing with new online tools and methods, as well as more traditional offline channels. It highlights the need for support for youth (information) workers in this domain, and the need for cooperation between different sectors and organisations, to ensure that people working with young people are sufficiently trained to communicate effectively with them. Every year, ERYICA launches the European Youth Information Day Campaign on 17 April. The campaign aims to enhance the visibility of youth information and to raise awareness about the information needs of young people and those organisations working every day to match these needs. Members are encouraged to spread the campaign via their various social media channels. 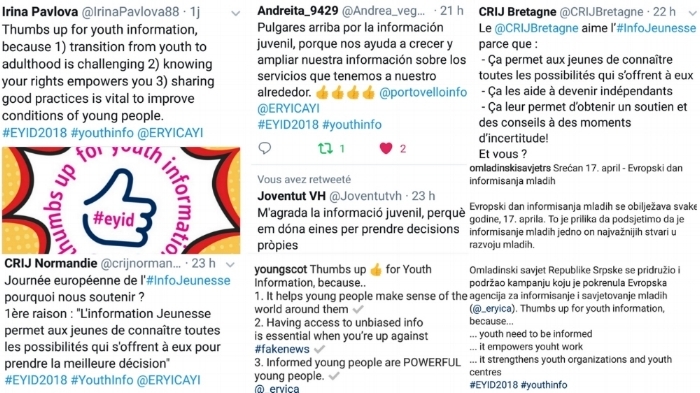 This year's campaign focuses on the visibility and recognition of youth information, with the slogan 'Thumbs up for youth information, because...' to present 3 reasons to support and promote youth information and with the use of a Thunderclap campaign to reach a widest audience on various social media channels, such as Twitter, Facebook, Instagram, LinkedIn.